13 Jun 2017 - 737-800, 9M-MXH (40135 / 3911), FF Jan 2012, operated by Malaysia Airlines landed on runway 25R in heavy rain and thunderstorm at Jakarta, Indonesia (WIII) at 20:08L (13:08GMT). The aircraft veered right immediately after touchdown and departed the edge of the runway bursting the RH tyres. Control was regained and the aircraft vacated the runway on a high speed taxyway and disembarked the passengers there. The crew had delayed their approach for 14 minutes due to the poor weather. On 13 June 2017, a Boeing 737-800 aircraft was being operated by Malaysian Airlines on a scheduled passenger flight from Kuala Lumpur International Airport, Malaysia to Soekarno-Hatta International Airport, Jakarta, Indonesia. The aircraft departed from Kuala Lumpur with flight number MAS 725 and cruised at Flight Level (FL) 390. On board the aircraft were 2 pilots, 4 flight attendants and 61 passengers. In this flight Pilot in Command (PIC) acted as Pilot Flying (PF) and the Second in Command (SIC) acted as Pilot Monitoring (PM). There was no report or record of aircraft technical system abnormality prior to the departure until the time of occurrence. The flight since departure until commenced to approach was uneventful. While approaching to Jakarta the weather was heavy rain and thunderstorm. At 1308 UTC, the aircraft touched down runway 25R and veered to the right. 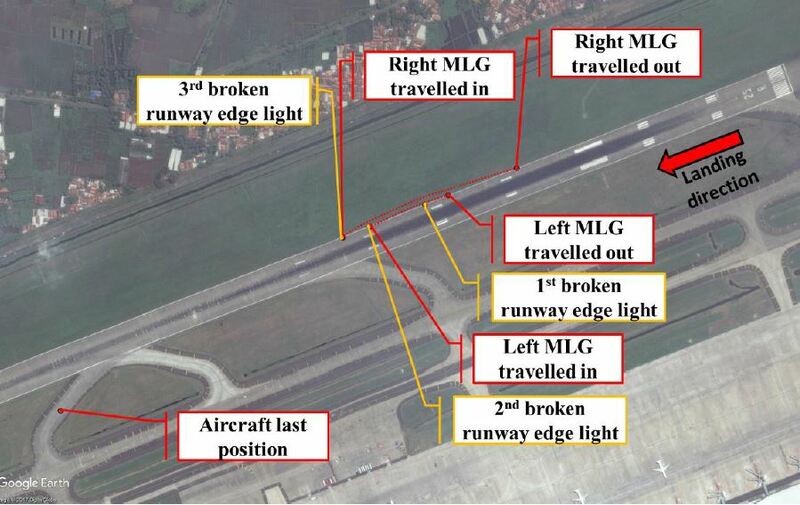 At approximately 580 meters from the beginning runway, the aircraft travelled out from runway pavement then returned to the runway at approximately 900 meter from the beginning of the runway. 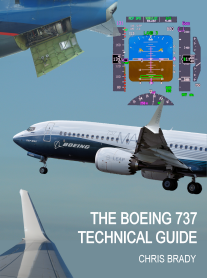 The left main landing gear impacted two runway edge lights and the right main landing gear impacted one runway edge light. During the landing roll, the pilot reported Mayday to Jakarta tower controller that the aircraft skidded off from runway and responded by confirming that the pilot intended to make a go around. The pilot advised that the aircraft was skidded off the runway and continued vacating the runway via taxiway November 4 (N4). The aircraft stopped on the taxiway N4 with both tires of right main landing gear were burst. The Jakarta tower controller informed that the towing car and ARFF unit were deployed. The occupants were disembarked on taxiway N4 using passenger stair and at 1425 UTC, the occupants transported to the terminal building by bus. There were no injuries to persons as a result of this occurrence. The aircraft has minor damaged. 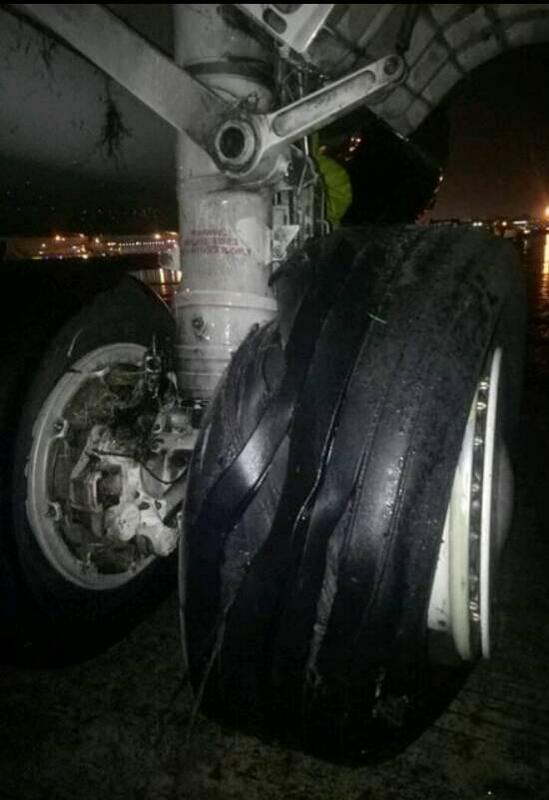 The outer tire of the right main landing gear was burst. All other tires damaged over limit. Some punctures found on the left inboard flap and right and left wing body fairings. There were three runway edge lights damaged. At the time of issuing this preliminary report, the Komite Nasional Keselamatan Transportasi had been informed of safety actions taken by Malaysia Airlines resulting from this occurrence. Komite Nasional Keselamatan Transportasi (KNKT) considered that the safety actions issued by the aircraft operator were relevant to improve safety. In this preliminary report, KNKT consider not to issue safety recommendation. The investigation is continuing and KNKT plans to complete the investigation within 12 months since the day of the occurrence. Should any further relevant safety issues emerge during the course of the investigation, KNKT will immediately bring the issues to the attention of the relevant parties and publish as required.